1. 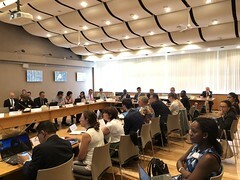 The meeting of the working group on enhancing the effectiveness of the Rotterdam Convention was held at the Ministry of Environmental Protection and Regional Development, Riga, Latvia, from 4 to 6 June 2018. 2. Opening remarks were delivered by Mr. Rinalds Muciņš, State Secretary from Latvia, Mr. Carlos Martin-Novella, Deputy Executive Secretary of the Secretariat of the Basel, Rotterdam and Stockholm Conventions and Ms. Christine Fuell, Senior Technical Officer at the part of the Rotterdam Convention Secretariat hosted by the Food and Agriculture Organization of the United Nations (FAO). Visit our flickr page to view pictures from the meeting.